Understanding the effects of a material’s morphology upon the overall material performance requires a detailed understanding of its initial morphology and how it changes under external stimuli. No technique can measure the 3D structure of materials on many size and time scales like X-ray computed tomography (CT). This technique is an indispensable tool for materials development and characterization. With this technique, 3D images of a material are collected, non- destructively, providing a probe into its internal 3D structure on features as small as 150 nm to multi-mm in scale or on time frames as short as 0.25 seconds per 3D image and on materials as diverse as aerogels to plutonium. This provides a better understanding of its manufactured morphology, after-experiment morphology, and even the morphological changes during the experiment. This presentation will focus on four recent topics on the use of X-ray CT and confocal micro X-ray fluorescence within the Materials Science and Technology Division at Los Alamos National Laboratory to answer a variety of materials challenges of National Security importance. These challenges include understanding metal damage and solidification, mechanical response within 3D printed materials & blown polymer foams, and quantification of embedded metallic layers. On top of these challenges, much of our research has focused on improving the robustness of CT measurements and making them more quantitative. Probing questions such as, “How many radiographs do I really need to acquire?”, and “What resolution do I need so that the statistics are related to the object and are not skewed by the number of voxels within the object?” provides a foundation to answer these materials science questions with more confidence. On top of these simple analytical metrics, CT provides a robust starting point for modeling as well as digital volume correlation studies to better relate processing with structure, and ultimately, mechanical performance. Dr. Brian M. Patterson is an R&D Scientist and Team leader of the Performance and Qualification team in the Engineered Materials Group, MST-7. He graduated from the University of Toledo with a Bachelor of Education, teaching high school science for two years before entering graduate school. He received a Ph.D. in Analytical Chemistry from Miami University, Oxford, OH in 2004 under the direction of André J. Sommer developing techniques in infrared micro-spectroscopy. 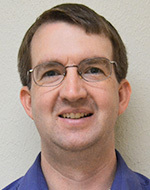 He joined the Chemistry Division at Los Alamos National Laboratory under the direction George J. Havrilla as a post-doctoral researcher in 2004 working in the area of micro X-ray fluorescence and FT-IR imaging. Brian was converted to a LANL staff member in 2006. Brian’s expertise and research interests are in materials analysis using X-rays; specifically micro- and nano-scale X-ray computed tomography and micro X-ray fluorescence. Using these techniques he answers a variety of materials science questions relating to: high explosives, polymer foams, aerogels, carbon fiber composites, damaged materials, and low density materials examining defects (intentional and unintentional), voids, and the distribution of their component materials. He specializes in morphological structure quantification and in situ dynamic measurements using both laboratory- and synchrotron-based instrumentation and overlaying imaging techniques to synergistically answer questions in 2D and 3D. He also currently serves on the editorial board of Microscopy Today.